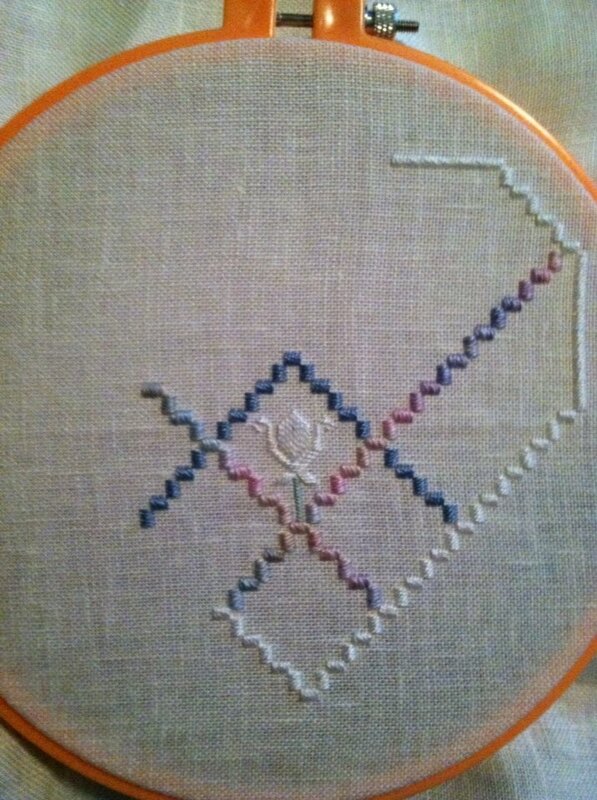 If you are a stitcher, you know that WIP stands for Work In Progress and is usually done on Wednesdays. This is one of my current WIP’s that I actually started yesterday. It is also appropriate considering that Embroidery Central (EC) is hosting a trunk show highlighting this designer and their patterns are on sale this month. Now, for some details. This pattern, Winter Into Spring, is one of four from a leaflet titled ‘Heart of My Heart’ and it is a hardanger pattern. It has two hand dyes threads from Caron that are the same color, Parfait, but are from different collections – Watercolors and Wildflowers. One is a hand dyed silk and one is a heavier hand dyed cotton thread. There is also ribbon embroidery on this heart which I just can’t wait to do. This is probably the reason why I started this project instead of working on a project I need to finish. There are currently two types of cotton thread – DMC and Anchor – that are favored among stitchers. The argument between the two is usually based on color, price, and quality. DMC currently offers the most colors with subtle shading from tone to tone. If you are looking for a range of colors than DMC is the product to buy. Anchor colors are brighter and richer then DMC but do not have the range of colors. You can easily substitute Anchor for DMC. You cannot easily substitute Anchor for DMC; you will be using one Anchor color for three of DMC colors in a bigger project. DMC is the lower priced thread and can be found everywhere. This makes DMC affordable and available to those of us who stitch lots and lots of projects. Anchor is more expensive and usually only sold in stores that specialize in needlework supplies. Keep in mind that it is up to the shop owner or shop manager to decide what products will be sold. DMC and Anchor both have excellent quality. There is a slight difference in my mind but it is not worth mentioning. Especially, since quality is the touchiest subject among stitchers. You will find that there are some stitchers who will only use one over the other and condemn the other; in other words, quality is a matter of personal preference. I should mention that there is one other company that makes cotton floss – JP & Coats. This use to be the ideal type of thread to use for anything until DMC hit the market. You can still find JP & Coats on the internet and in some discount department stores like King’s or Alco. However, like Anchor, it doesn’t seem to have the color range that DMC does. It is decently priced with about the same quality as the other two. In the next part, we explore metallic threads. In the meantime, keep stitching.